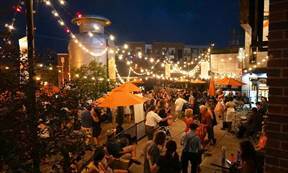 "Swingin’ Under the Stars Saturday"
Denver's iconic "Little Man Ice Cream" and "Swingin' Denver" team up to present a summer outdoor swing extravaganza with any one of Denver's hottest bands every Saturday night. A free swing dance lesson at 7:30pm and during the first band break for those who wish to learn the basic steps. No partner or experience required. Come enjoy an evening of the best swingin' ice cream in town.